K-12 tech integration versus higher ed: Flipped? 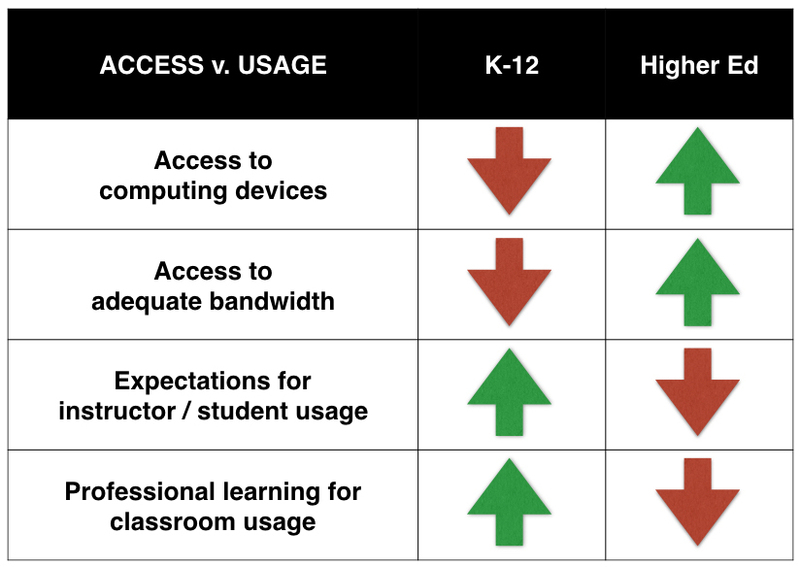 In K-12, we struggle with access. Most schools are trying to get more technology into their classrooms. It’s not a given yet that students will have regular access to digital tools and adequate bandwidth in their learning spaces. That said, most schools have expectations of teachers that they will integrate technology into learning experiences whenever they can and provide often-mandatory professional learning for instructors on how to do that with the students in their classrooms. It seems to me that the opposite is usually true in higher education. Bandwidth is pretty robust on most postsecondary campuses and most students are bringing computers of some sort with them to college. Access seems to be less of an issue. That said, institutional expectations of instructors for technology integration in classrooms are fairly low. Professional learning opportunities for faculty are mostly invitational rather than mandatory and tend to focus more on moving courses online than on how to use technology with students in face-to-face classroom settings. Agree? Disagree? What is your experience? Is there room for creativity and sharing in a professional preparation program? Why do you think expectations for instructor/ student usage is higher in K12? Higher education treats the instructors as the experts, not idiots. I see this problem in our district. The technology available in the classroom can’t keep up with the policies of integrating technology use in the schools. We also lack training, but again are required to use technology. In some districts technology is still far behind. In my district for example technology means having an old laptop a projector and an old document camera. Well at least in my district I feel that we are left on our own when it comes to utilizing technology. There is no training, no basic information.